Materials: rope, nets and straw. Dimensions: m 25 x 10 x h 12. Sangdrol is a young Tibetan nun who was arrested by the Chinese authorities when she cried out for liberty for Tibet in a public square; she was charged with “separatist activity” and sentenced to eighteen years in the prison of Drapchi. 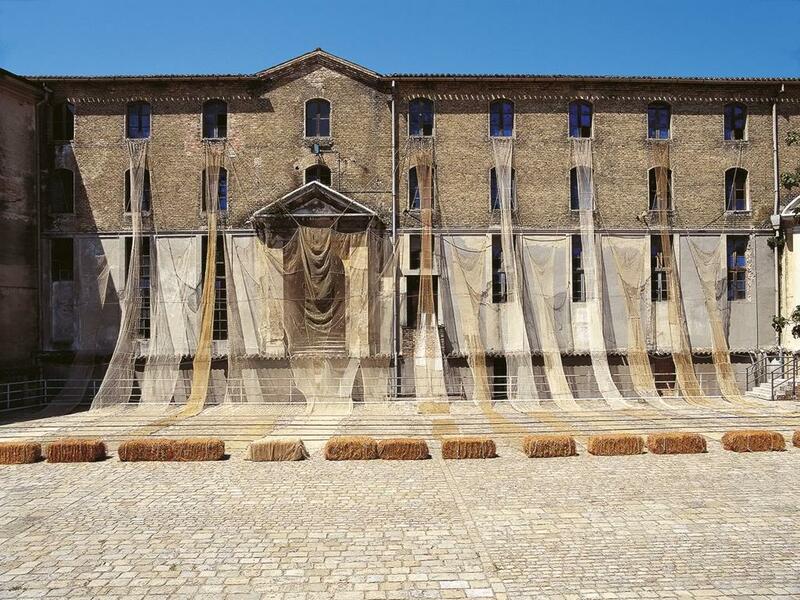 On hearing of the dramatic story of this nineteen-year old nun, publicized by the Tibet Information Network, Maria Dompè dedicated a large installation that involves the entire side of the courtyard of the Lazzaretto in a continuous play of atmospheric elements. The choice of materials, once again, is profoundly attached to the environment in which the work is placed and to the poetics of the incursion into the space. 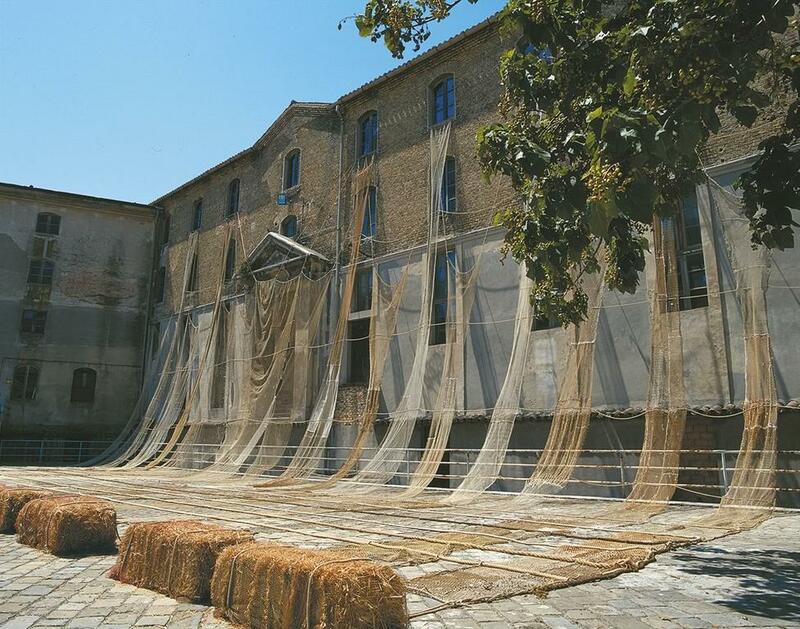 The nets, which cover the walls and invoke the Tibetan use of textiles exposed to the wind, are actually old fishing nets that Dompè has sown together with the help of local fishermen. The experiences of those who use the nets joins with the history of a place geographically far away, but ideally close, to Sangdrol. The ropes slow down the vertical rhythm of the strips of netting, up to the horizontal expanse created by the bails of straw, obviously belonging to a rural civilization. 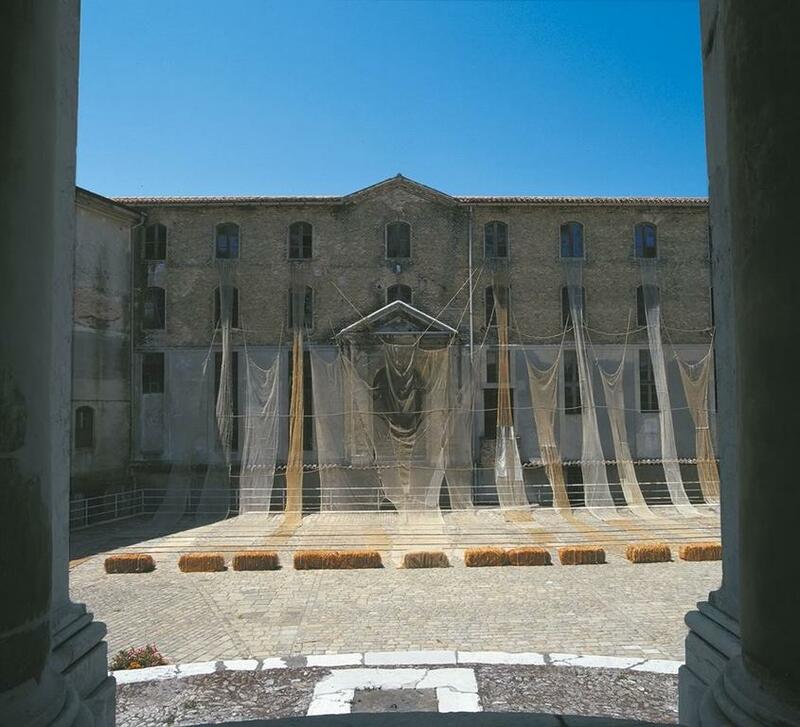 The courtyard of the Lazzaretto, which is completely within the traditions of western architecture, welcomes the work in a perfectly integrated manner; furthermore, the work enriches the architectural space with new ideas in terms of materials and poetry, and becomes, by means of the airiness of the environment, a meditation on the reality of Tibet.